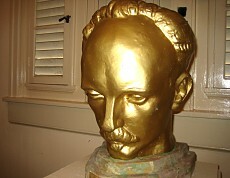 "The Life and Works of José Martí: 1853 - 1895"
This exhibit is a collection of photographs and documents of Cuba's legendary patriot and poet, José Martí, curated by renowned historian Carlos Ripoll Ph.D. The exhibit was donated to the San Carlos Institute by Florida International University. Its president, Dr. Modesto Maidíque, personally presented the exhibit to the San Carlos during the Institute's reopening ceremonies in 1992. This exhibit is an overview of Cuba's postal history from the pre-philatelic period to 1939. It includes folded letters (pre-philatelic covers), stamped envelopes, and historic postcards, which have never before been published. This exhibit has text by Joseph Geraci, Philatelist (Emeritus) from the National Postal Museum, Smithsonian Institution. This exhibit is an overview of the beginnings of commercial aviation history between the United States and Cuba. It includes many envelopes and stamps commemorative of events in Cuba's aviation history and presents the research of Ronald E.G. Davies, Aviation Historian, National Air and Space Museum, Smithsonian Institution. A portrait collection featuring all of Cuba's constitutional presidents from Tomás Estrada Palma (1902) to Carlos Prío Socarras (1952). The portraits were painted by Cesar Beltrain in 1998 and donated to the San Carlos Institute. Sponsored by American Express, this exhibit, scheduled to open in the spring of 2008, will trace the history of the San Carlos Institute from 1871 to the present. It will include artifacts, photographs, and historical materials tracing the history of this important historical landmark and the Cuban-American community's perserverence in the effort to bring freedom and democracy to their homeland. Parties interested in presenting programs or exhibits at the San Carlos Institute should contact the President of the Board.